XXVII Viljandi folk music festival announces theme and design! 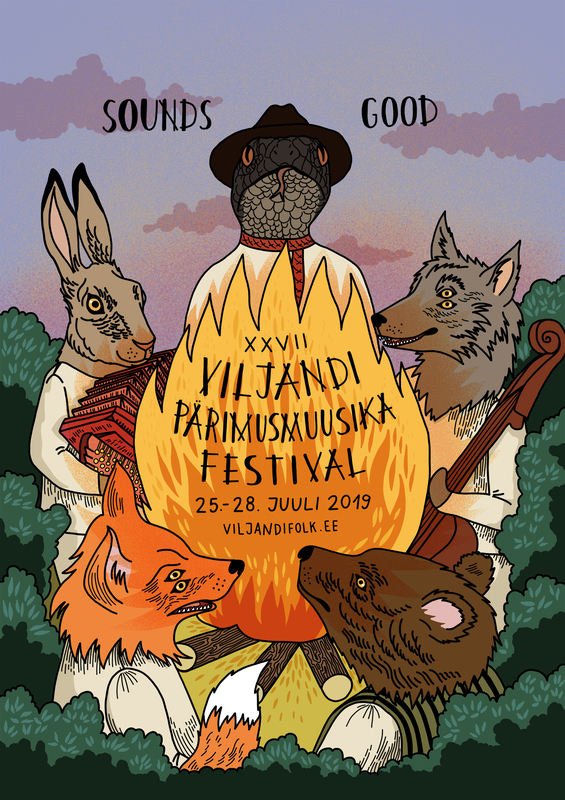 Preparations for the next Viljandi Folk Music Festival have begun and we are so excited to announce the theme and the design for the festival! The theme is "Sounds good!" XXVII Folk Music Festival focuses on fascinating and significant musical stories. How where different songs born? How did the musicians come across their tunes? Why is the artist singing exactly those songs or playing these tunes? Why do they sound so good? What’s the story behind the tune? We love to listen to stories that are told in an eloquent and vivid way, we enjoy tunes that are played with a personal touch and are full of surprises – they enchant and delight us. These stories stay with us, we want to listen to them again and again, we want to share them with others. “Sounds good” or “Story behind the tune” focuses on the meaningful music, significant musical tales and the personal link between the musicians and the tunes. Folk music is all about sharing. Everybody’s involved and equally important – the musician, the dancer, the listener. In the middle of this interaction is the music, acting as social glue, creating bridges and getting the party started. Folk music, in its natural form, is transmitted orally, passed on from one person to another. That’s why it is so important to have catchy and inspiring role models to keep the tradition alive. Musical story comes alive only with the help of a performer. Some of us are especially gifted storytellers. Simple and well-known tunes can miraculously become utterly captivating in the hands of some musicians. What’s the magic behind those miracles? This summer, great storytellers from all over the world will come together in Viljandi to share their stories, be they songs, melodies or fairytales. A special place in this year’s programme is dedicated to runo-songs. Runo-songs are our most ancient, important and intimate stories. Unfortunately, the message within these songs might be hard to grasp because both our language and surroundings have changed a lot over the years. A really good interpreter is needed to understand those stories, one who has talent and special skills to unravel the complex world of runo-songs in an enthralling way. Luckily we have talented lead singers amongst us, who have all those qualities. We have a chance to enjoy their skills at the end of July, in Viljandi. See you in Viljandi, where the good stories are waiting for You! Eili Lepik, the author of the artwork, was really happy for the chance and after hearing the theme, knew right away which way she wanted to go with the design: “Storytelling is such an important part of our folklore and for me the theme really linked with Estonian folk tales. So I took some characters from the tales and I decided to emphasize on their mysterious and supernatural side, giving some of them four eyes, for example.” This supernatural ambience is characteristic of Lepik’s work. Lepik added that working with Viljandi Folk Music Festival team has been brilliant.